Bank Notes came into being several years before the actual publication when Keith Giammanco made the extremely unwise decision to steal what he wanted from others without thought about that loss. That decision has been worried to pieces in the media and on reviews. Giammanco doesn’t defend his decision, although he does softly excuse it because of his perceived needs at the time. The catalyst decision is no longer an issue because the courts have decided a punishment plan and as the book says, Giammanco is serving a lengthy sentence in a Missouri Penitentiary. The expansion of that sentence through further charges locally after the federal charges had been answered are the subject of controversy throughout the book. 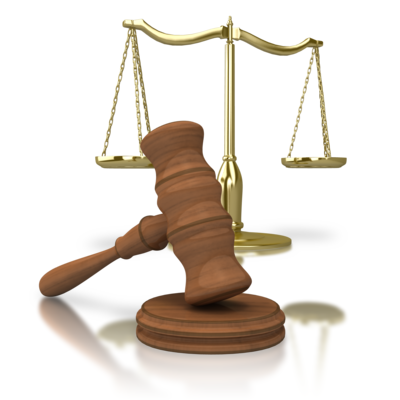 Does the second prosecution violate double jeopardy conviction? I am not a legal expert; not conversant in the manipulations available to prosecutors which may not meet fairness measures, but aren’t illegal. It is a head scratcher as to the necessity of the second prosecution after the Federal courts had handed out a lengthy sentence. While the crime was despicable, it was non-violent and there had not been previous criminal issues. The book ‘gently’ discusses the prison environment from inmate society to administration. This book is not about the inmate society except for the parts where Keith and Caroline are at various times at risk. There seemed to be more times when Caroline’s safety was more at risk from administration than inmates. There is a mission involved in the story of Bank Notes. At first reading, one might think the mission is to get Keith out of prison, together with family and on with life. I’m sure this is one of the missions of the team, but exposing the sloppy and corrupt prison system is a greater mission. The conditions of the last encounter where Keith is moved to a different facility, but he and Caroline are denied visitation priveleges would seem to have personal motivations…”punish these people for getting together and speaking out” with a goal of separating them. As an observer/friend, i see this petty decision as having the opposite effect. Their connection is not infatuation, but more mature and solid. Being physically separated only brings them closer and more dedicated to the mission of reform. Bank Notes has been criticized as being too sympathetic with Keith Giammanco’s actions. To that I say, “So what.” He admits he made extremely stupid choices and accepts the punishment meted out, even that which seems quite unfair. He’s used the time to make life better for others in the inmate community by helping with education. Part of the reform mission involves giving inmates different tools to use when they are back in society…tools that can help them become contributing members of the outside community where they have family who need them. One thing about Missouri — it isn’t very good at being sneaky, invisible crooked. Those things happen right up front where they can possibly be addressed and see some rehabilitation such as that we might desire for prisoners. As the Giammanco family takes a stand about the flaws in the prison system, their intent isn’t to embarrass individuals, but to have a system that builds rehabilitation rather than mirroring criminality. Author, Caroline Giammanco, is a contributor to Ozarks Mystique, an Ozarks native and blogger at BoonieHatBandit.com. And a friend of mine who crochets, teaches and enjoys puppies. The cause around the need for reformation in the Missouri prison system is being addressed through efforts at End85.com. There are other efforts out there, I am sure, but this is the one with which I am most familiar. The group moving through End 85% Law addresses the issues of government money (‘government’ translation = you and me) distributed to states for increased incarceration. This has become another bureaucratic albatross, abandoned even by the ones who developed it. They now say “Error — it costs too much.” Missouri has yet to join other states in abolishing the 85% minimum sentences served before being eligible to meet with the parole board. I’ve had the pleasure of reading two books from the Annie’s Mysteries Unraveled series (Annie’s Mysteries) which were elegantly written by K.D. McCrite. Kate Stevens and her crocheting talent have moved to a TOTALLY different part of the country. As K.D. McCrite takes Kate — a believable and warm character — from Maine to Texas, I was entirely enjoying the descriptions of her new home and her creations. Had to grin at her experiences with Social Media and the Internet because they sound so much like folks I know who are just trying get familiar with technology. Then, the author scared the ‘bejeezus’ out of me with the STALKER! Who is doing this — has to be someone Kate Stevens knows and probably trusts. Without writing a story that never ends, K.D. McCrite gives readers colorful detail and keeps the ‘secret’ till just the right page. Kate Stevens is back in K.D. 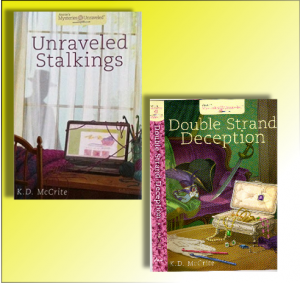 McCrite’s latest mystery novel, part of the Annie’s Mysteries Unraveled series. Kate is working on a new men’s sweater pattern for the coming holidays — light romance when she gets her favorite hunk, Peter Matthews to be the size model as she develops the design. Between the stitches, Kate and Vivi find a mutual friend involving them in a local charity ball which demands each guest come in costume. These unrecognizable guests participate in an unusual treasure hunt at other homes in the community. Now, the mystery kicks in. K.D. McCrite writes a smooth mystery along with the colorful descriptive story, managing to make Vivi a prime suspect in the plot. The other characters have to figure out ‘who dun it’ as they do beautifully under the guidance of McCrite’s agile pen. Readers are kept guessing right up to the ending. I admire K.D. McCrite’s modern writing style — she gives the readers full pleasure without making the book seems as if it will never end. She gets it all told in an amazingly pleasant amount of space. Readers get vivid descriptions, alerting drama, light romance and a darn good ‘yarn’ (pun intended) in a beautiful physical package from the Annie’s Mysteries Unraveled series with NO vulgarity. Great for readers of any age who want to read a good book. Disclaimer — I am personally acquainted with the author and have talked with her in the past about the energy required to write a seriously good mystery that still gives readers pleasure reading with good description, a touch of romance, solid friendship and family with NO vulgarity. Did I mention that these books from Annie’s Mysteries Unraveled are gorgeously presented and edited? To say I loved the books is a major understatement. K.D. has novels in other series from Annie’s Mysteries: Annie’s Attic Mysteries and Annie’s Quilted Mysteries which I have enjoyed as much as these. All excellent reading. Since Annie’s Mysteries are a membership source, if you are not a member, sometimes you can find copies of the books in the secondary market. For more good reading, I highly recommend the Confessions of April Grace series. While April Grace is a young person, the stories have poignancy for all ages and wonderful life lessons gently delivered. K.D. McCrite has brought an excellent piece of the mysterious puzzle facing quilter friends who’ve had a third friend murdered. They seriously pursue justice for their friend in Raven Threads. Ravens and rancor are at the center of Raven Threads as lifelong friends, Emma and Kelly leave their quilt design restoration shop, “Cotton and Grace” in the hands of family while they track down a clue to the murderer of another friend, Rose. The mystery is 15 years old and unsolved…will the Raven have the answer? Will their efforts bring freedom for a talented artist and peace for a family? I enjoyed the quilting and crafting conversation sprinkled through the book along with the lengths the friends go to trying to find justice for the friend they lost. A simple mystery would have been over in a few pages without the maze of sub-plots that author K.D. McCrite is so good at weaving together as a story/tapestry. We find romance, fear, art, along with major friendship among the Nimble Thimbles quilting group. I liked member, Walter, the retired geometry teacher who brought a line perspective to a craft usually left to women. The community around Mystic Harbor is the dream of small towns across the country with side by side small specialty shops that seem to be successful. And rather different from the situation at the small, hostile town of Avonlea where they must go to track down their raven clue and find of the woman with the Raven necklace is the murderer. Or what she knows. As we’ve come to expect from all Annie’s books, the Annie’s Quilting Mysteries are well-written, edited and beautifully produced with stunning jackets, stitched spine and ATTACHED satin bookmarks. The story and the presentation are purely ART! The title Snow Fence Road raised totally different expectations than Phyllis Edgerly Ring‘s book delivered for me. The layered, charming story has warmth in the characters — for a few pages you might wonder how these people will all have some deeper connection for one another, but this story benefits when the author doesn’t force feed the reader. It is another story about an Inn/Bed and Breakfast — that seems to be a favorite setting for the books that I enjoy reading! There are more ‘Inn Books’ reviewed at Cardinal Bluff in recent posts. A Fantastic Story Set Along the Maine Coast. A layered story set at the Spinnaker Inn along the coast of Maine where characters must walk through love and loss. The twists in the story run the gamut from dramatic to silly, and coincidental. Boy, can the heart get those soap-opera thumps and bumps when someone does something because she or he didn’t know how that would affect the people on the other side. Because I like inns, I enjoyed the side details of the activity and renovation projects as the Spinnaker Inn, Claire’s family home business by the investment from Tess, using the money she inherited from Andy! See what I mean about Twists? How will Evan be able to overcome the loss of the extremely talented Celia to enjoy a stable relationship with Tess? Where will life take Claire and Rowan and the tangles they’ve built? And let’s not leave out Tess’s creative and encouraging mother or the neighbor, especially Dickie and father Gil at the general store. Matthew is charming as the child ‘foil.’ All through the delightfully described seasons — the author knows about driving on bad winter roads…she nailed it. Other detail covers some extremely talented portrait and setting artists. Snow Fence Road was a total surprise to me. I was expecting something totally different than this layered, charming and lovable story. I highly recommend it for your reading pleasure. A well-written, inspiring book….profanity is little to none, conversation never drifts toward the ‘coarse’ and no erotica.